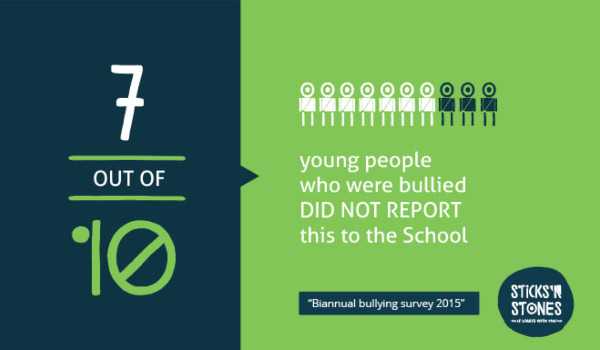 Since 2013, we have been doing bi annual surveys across the Central Otago region to find out more about the experiences and perceptions about bullying from other young people. We also make our survey available to other schools as a baseline to collect their own data and use this to work out what the issues are in their schools. Since 2013, our young people have collected data from 11-18 year olds across the Central Otago region to get a snapshot of Bullying and Life online. In the beginning, we worked with our local Youth Trust to include some of our questions in their youth survey alongside their other questions. What we found was that when young people are not involved in creating the questions and making sure the wording connects with us, it becomes ‘just another survey’ and we already fill in heaps of these through school. This means that a lot of the time the questions are based on ‘assumptions’ about what we think and what we do. The result? We write what it is we think the adults want to hear and don’t honestly reflect on what is happening for us. We wanted the data to be a more authentic representation of young people’s experiences and for our young people to be fully involved in all aspects of the data collection, collation and evaluation. Co-designing from the planning stages mean that our action research can be clearly from young people to other young people and that the results can help us to understand the issues and do something about them. In 2015, 1345 11-18 year olds (69% of young people at school in our region) took part in our survey. With funding from Facebook, our young people took part in training with Synergia and then had support from them to put together a survey that would gather data from young people in a more meaningful way. Dr John Fenaughty from Auckland University again provided feedback on the questions and suggested improvements. Google NZ provided Chromebooks as prizes for schools that supported us to reach our 70% of students target. Young people took responsibility for the inputting of the responses from paper surveys and worked alongside our facilitator for the analysis. Training, mentoring and support was provided by Synergia on survey data analysis, interpretation and presentation. One of the things we found was that 48% of young people that had experienced bullying in the past 6 months did not tell anyone or reach out for help; they ignored it and hoped it would go away. This really motivated us to think about how we could support young people affected by bullying and negativity to know what steps, tools and support were available so they could easily decide what would be best for them. From here we started planning our online tool that would become ICON. In 2013, our Project Facilitator worked with the Alexandra Districts Youth Trust to collaborate on a survey. Our sections around bullying and life online were in response to TIMMS 2011 data reporting that 68% of Year 5 and 45% of year 9 students had experienced bullying behaviours “about weekly or monthly” at school. We wanted to collect baseline data to identify how much of an issue bullying was in our region. Dr John Fenaughty from Auckland University gave feedback on our questions related to bullying and also on ethical considerations to be included. In 2013, 747 young people aged 11-18 completed the survey and 34% of them reported they had been bullied in the past year. Almost 87% of young people responded that they believed cyberbullying was an issue for them and their peers.